Churchill Downs-based star Seeking the Soul is set to bid for repeat glory over his home track in Friday’s 144th running of the $500,000 Clark Handicap Presented by Norton Healthcare (Grade I), the premier race of the historic track’s Fall Meet. Seeking the Soul, owned by Charles Fipke and trained by leading conditioner Dallas Stewart, most recently finished second to City of Light in the Nov. 3 Breeders’ Cup Dirt Mile (GI) at Churchill Downs, his fifth start of 2018. A 5-year-old homebred son of Fipke’s prized stallion Perfect Soul (IRE), Seeking the Soul survived a jockey’s objection in last year’s running of the Clark Handicap after the rider of third-placed Hoppertunity, Florent Geroux, claimed Hall of Fame rider John Velazquez interfered in the late stretch run. After review from the stewards, the claim was disallowed and Seeking the Soul’s half-length win stood as is. Following the Clark, Seeking the Soul was entered in the $16 million Pegasus World Cup (GI) at Gulfstream Park but finished a disappointing fifth. Velazquez has the call on Seeking the Soul (22-6-5-5—$1,652,542) in the eight-horse Clark and drew post position No. 3 as the 123-pound starting high weight. Among the formidable rivals to Seeking the Soul in the Clark is Steve Landers Racing’s Fayette Stakes (GII) winner Leofric (13-7-1-3—$650,340) for trainer Brad Cox. The gray son of Candy Ride (ARG) is in search of his first Grade I victory for the Louisville-based conditioner. Leofric’s 2018 campaign began at Oaklawn Park in early January with a narrow victory in a non-winners of three allowance race. 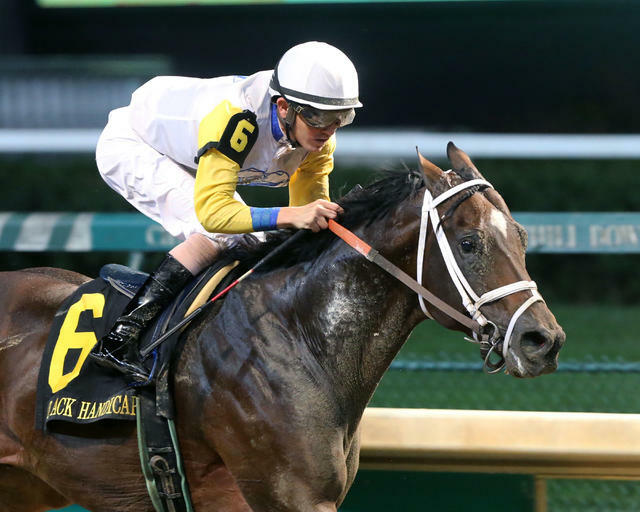 The 5-year-old Kentucky-bred tried stakes company in his next start, the Razorback Handicap (GIII), but finished second to fellow Clark rival Hawaakom. The seven-time winner is poised to close the year with a bang following a victory in the West Virginia Governors Cup (GIII) at Mountaineer and a third-place effort in the Woodward (GI) prior to his Fayette score. Cox’s regular rider Geroux, who won the 2016 Clark Handicap aboard eventual 2017 Horse of the Year Gun Runner, has the return call and drew post 5 with a 121-pound assignment. Breaking just outside of Leofric is the ultra-consistent 3-year-old Bravazo (15-3-3-3—$1,206,528) for Hall of Fame trainer D. Wayne Lukas and Calumet Farm. The Awesome Again colt will attempt to give Lukas a record-tying third win in the race after previously winning with Will Take Charge (2013) and Surfside (2000). Both of Lukas’ previous winners were 3-year-olds that cemented year-end divisional championship honors. Bravazo has competed in many of the top races in 2018, including all three legs of the Triple Crown, the Haskell (GI), Travers (GI) and Breeders’ Cup Dirt Mile (GI). Most notably, Bravazo finished second in the Preakness (GI) behind eventual Triple Crown winner Justify and third, 2 ½ lengths behind Seeking the Soul, in the Breeders’ Cup Dirt Mile. The three-time winner will have the riding services of Joel Rosario at 118 pounds in the Clark Handicap. Invading from the West Coast for the Clark is DP Racing’s Prime Attraction (19-4-4-2—$499,545), who led nearly every step of the 1 1/8-mile journey in the Fayette before Leofric surged for a narrow victory. Trained by James Cassidy, Prime Attraction remained in Kentucky following the Fayette with his son, Christopher. The 5-year-old by Unbridled’s Song was banging heads with eventual Breeders’ Cup Classic (GI) winner Accelerate in the Pacific Classic (GI) and Awesome Again (GI) before shipping east to Keeneland in October. Regular rider Kent Desormeaux has the call on the four-time winner and drew the rail with a 120-pound weight assignment. The complete Clark Handicap field from the rail out (with jockey, trainer and assigned weight): Prime Attraction (Desormeaux, Cassidy, 120 pounds); Hence (Ricardo Santana Jr., Steve Asmussen, 118); Seeking the Soul (Velazquez, Stewart, 123); Hawaakom (Joe Rocco Jr., Wes Hawley, 116); Leofric (Geroux, Cox, 121); Bravazo (Rosario, Lukas, 118); Storm Advisory (Albin Jiminez, Anthony Quartarolo, 114); and Sightforsoreeyes (Tyler Gaffalione, Quartarolo, 115).